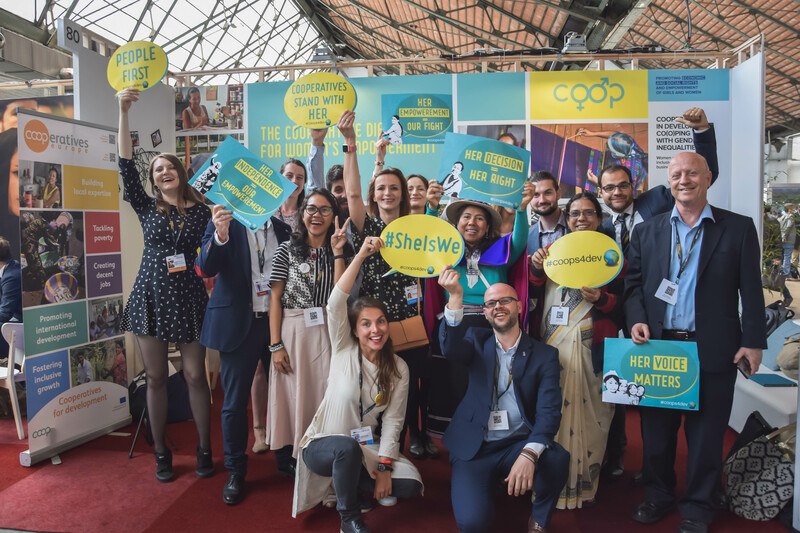 The 2018 European Development Days were held between 5-6 of June in Brussels where the Cooperatives Europe Development Platform (CEDP) members showcased a stand with its recent work, hosted guests from abroad and from other partner organisations as well as organized a brainstorming session on the role of cooperatives for women’s and youth empowerment worldwide. The annual forum on development and international cooperation organised by the European Commission this year aimed at raising awareness on gender equality and women's empowerment, focusing on the vital role of women and the need for their full and equal participation and leadership in achieving the Sustainable Development Goals and the Agenda 2030. The passers by were introduced to the work of the cooperative movement at the interactive stand, tested their knowledge through a quiz and held discussions with two cooperators from the field: Rama Lakshmi, APMS’ chief officer (DGRV’s local partner in India), and Asccensión Velasco Montano, first woman governor of the Cablido Guambiano, indigenous people territories in Colombia who provided unique insight into the successes and challenges of advancing women’s lives through cooperatives. The participants to the stand also made a video showing their support for women’s empowerement through cooperatives. Watch it here. The brainstorming session titled “Youth as key actors of change” brought together a full room of young people from different fields who eagerly participated to the discussions and debates on the role of youth for women’s empowerment with the consideration of the cooperative model. The morning session was moderated by Lorenzo Novaro, the representative of the Young European Cooperators Network (YECN) with the help of Sergi Corbalan (Fair Trade Advocacy Office), Anis Saadah (Indonesian Youth Cooperatives Federation), Yentyl Williams (ACP Young Professionals Network) and Khouloud Mannai (Trade Union Tunisia). Watch some of the discussions held by youth here and see some of the outcomes in the inforgraphic below. Thank you to all members, partners, workshop contributors and participants of EDD18 for an excellent and enriching showcase. Click here for our colourful photo gallery.